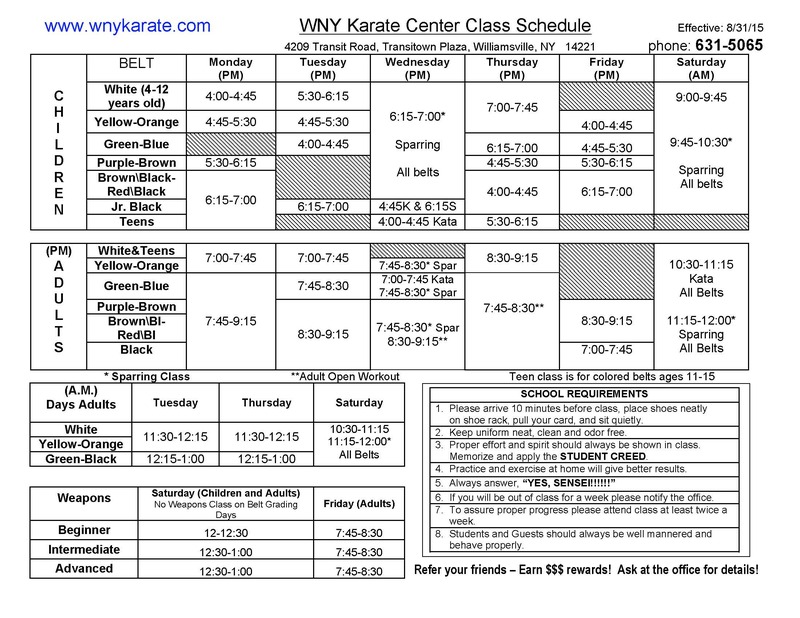 Why come to WNY Karate Center? Fitness: Lose weight and get fit! Our classes will help you build endurance, improve muscle tone, increase stamina, lose weight and reduce stress. Al Burget, one of our students, lost 45 pounds and dropped his cholesterol 70 points in his first 4 months! Tara Philipps, a life-long ballerina and currently a Third Degree Black Belt (Sandan) and one of our instructors, lost 25 pounds in her first 3 months! Whether you are already in shape, or looking to get in shape, our classes will help you improve your overall health and well-being. Awesome Classes: Our classes consist of a wide variety of activities, so there’s no time to get bored. A typical class begins with stretching and warm-up exercises, followed by kicking and punching techniques – either individually, with a partner, and/or with pads – self-defense techniques, and katas (forms). Self-Defense Training: WNY Karate Center teaches the most complete, well rounded and practical self defense techniques which you will begin to learn in your first class. Our highly skilled Black Belt instructors are all certified in Isshin-Ryu, but we also have many instructors on staff who are also Black Belts in other disciplines such as Judo, Aikido, Kenpo, Tae Kwon Do, Arnis, Kung Fu, and backgrounds in Jiu-Jitso, Shotokan and Tai-Chi. Learn how to defend yourself and your loved ones in the most effective and practical way, all while getting in shape and having fun! The current schedule of classes can be found here. Learn from the #1 competitor in Self-Defense in the Northeast! Karate is a physical and mental discipline, and is intended to improve one’s life in a positive way. Every class begins with reciting the Student Creed and ends with repeating the Black Belt Principles.